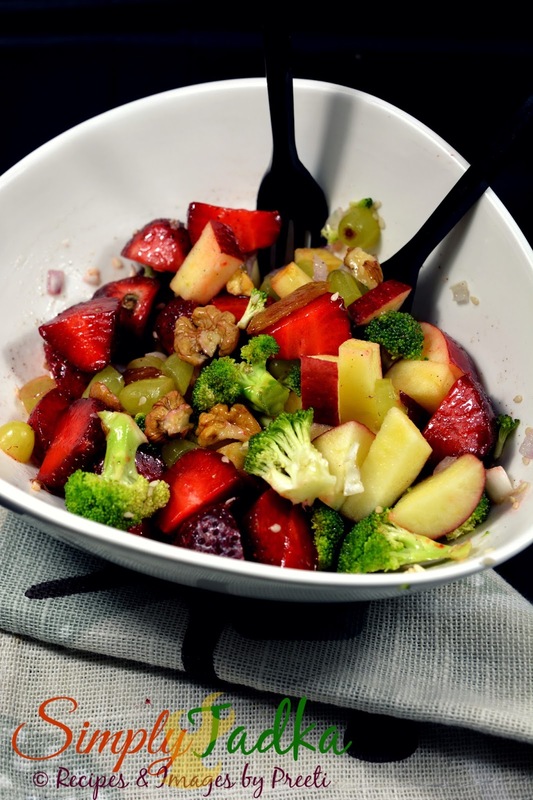 Broccoli strawberry salad is really awesome in taste and complete meal. This time i shared Broccoli Strawberry Salad with Apple Cider Vinaigrette. 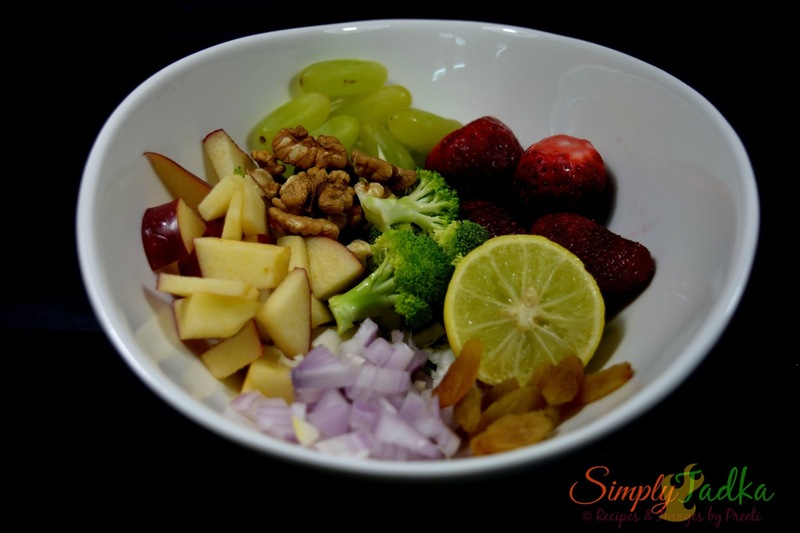 For this recipe, combine broccoli, strawberry, grapes, apple, red onion and roasted nuts and raisins together in one bowl and mix with apple cider vinaigrette. Apple cider vinaigrette is simple recipe which made by mixing oil, apple cider and spices. Broccoli is an edible green plant in the cabbage family whose is eaten as a vegetable. Apple cider vinegar is a type of vinegar made from cider or apple and has a pale to medium color. Apple cider vinegar is used in salad dressing, marinades, vinaigrettes, food preservatives and chutney. Its is made by crushing and squeezing apples. After fermentation process, sugar are turned into alcohol. After second fermentation process, alcohol converted into vinegar and its taste become sour. Vinaigrette is made by mixing oil with something acidic such as vinegar or lemon juice. This is commonly used in salad dressing. Combine water and apple cider vinegar together in one bowl and whisk well. Add honey and olive oil and whisk again till to dissolve. Add salt and pepper powder and mix it. Keep in freeze and mix at serving time. Combine all ingredients of salad in bowl and add vinaigrette and mix it. Serve chilled salad. Tags: How to make broccoli strawberry salad, apple cider recipes, apple cider vinaigrette recipe, salad recipe, healthy recipe, side dish, fruit recipe, broccoli recipe, strawberry recipe, apple recipe. Omg, what an excellent salad, never tried this combination, very unique salad Preeti. Colorful crunchy salad. Love that simple ACV dressing. That salad surely looks so inviting preeti..very nice one.. The salad sounds quite exotic. A healthy combination of broccoli and apple. A well balanced salad taste wise. Very colourful salad ! Healthy and delicious too , need to try this combo .